Product prices and availability are accurate as of 2019-04-20 06:06:42 UTC and are subject to change. Any price and availability information displayed on http://www.amazon.com/ at the time of purchase will apply to the purchase of this product. 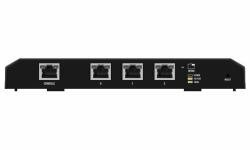 The EdgeRouter Lite from Ubiquiti Networks is a dynamite little router for those who want to dive into more advanced networking concepts and setup super-reliable enterprise-quality networks. Super flexible, fast, and reliable, the EdgeRouter is a member of the EdgeMAX family and the worlds first extremely affordable one million packet-per-second router. Made for the tech savvy home and business user, the EdgeRouter Lite is housed in a compact, fanless form factor and operates quietly as it delivers the powerful routing, security, and management features you require to efficiently run your network. This dual-core MIPS64 3 GigE port router is powered by the feature rich EdgeOS which has a next-generation graphical user interface. This compact router will take up very little space yet is highly effective. To save even more space, the EdgeRouter can be wall-mounted. The user interface is extremely attractive, clean, and highly configurable.